Security expert Abloy UK has launched an in depth white paper, entitled ‘Effective and Energy Efficient Access Control in Commercial Buildings’. Since the launch of the government’s Energy Savings Opportunity Scheme (ESOS), companies are now finding that greater emphasis is being placed upon how much energy is wasted in commercial buildings. 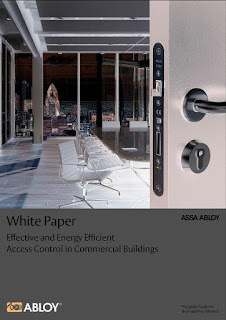 Therefore Abloy UK has prepared a white paper that explores the differences between the various locking solutions available, and makes recommendations on the best solutions for energy efficient access control. Raising awareness of the benefits of electric locks is a key message for Abloy UK as it looks to provide solutions that can help businesses and specifiers not only secure property, but also conform to any green agenda in a compliant way. “The introduction of the ESOS scheme means specifiers and building owners are now assessing the areas in which their premises can be more energy efficient, for example in lifts, heating, ventilation, lighting, and access control. “This means the assessment of access control systems is crucial, and solutions are being created for easy access and egress that are more energy efficient than some of the provisions currently in place.